Man is a social animal, he has to collaborate, cooperate and come across various people every day. Alone, one can never survive. We depend on some and some depends on us. It is a mutual experience where we share our thoughts & ideas with every other person. We need people for reasons and people need us in return as helping hand. It is the world of socializing where you have a long circle to communicate with. Social networking sites are especially designed to provide people a forum so they can channelize their thought process, get the knowledge and also to get up to date. 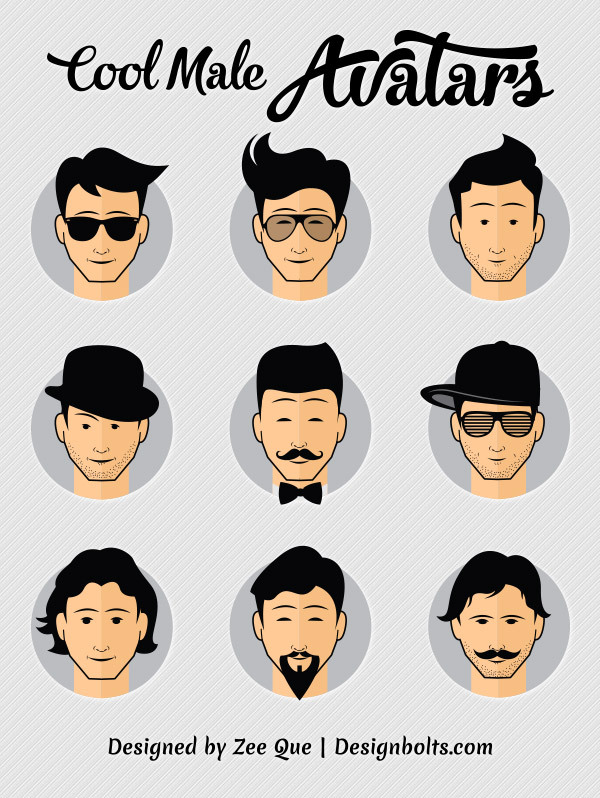 Today I am unfolding before you 9 free cool male avatars in Vector. These avatars are really fun, you can use them with ease and comfort anywhere you like, whether it is used as an email avatar, an avatar appearing along with comment box, or on a social networking site, these avatars will be your spokesperson. You can set any of them as your identity marker (display picture). Men love to play with their display pictures. So give these avatars a go and I am sure it will be a lovely experience. Macho and masculine elements are added into each of the avatar, moustache, chin beard, hipster goggles, side parting haircut, hat on the head, bow on the neck, ‘Johnny bravo’ puff style, and clean shaved faces are giving you ample choices to pick up your favorite impersonation. Men like to switch their look and appearances, perhaps they get bore of the monotony, change is always good. These avatars will give you a good turn. I am planning to start making such avatars more, but make sure you drop your feedback to us and let us know how much you liked them and want to have them in future too.